The major media casually dismiss “conspiracy theories.” Indeed, the phrase itself clearly demarcates the range of acceptable discourse; it is a verbal symbol of the walls of the polis. But we must at least acknowledge the sheer numbers of questionable political events that have occurred in the past sixty years: multiple political assassinations; Operations “Paper Clip” and “Northwoods” (google them if you must); mind control experiments; the CIA’s two-decade-long “MK Ultra program”; several mysterious plane crashes of political candidates and whistleblowers; Watergate; the “October Surprise” of 1980; the Iran-Contra scandal; allegations of CIA involvement in drug smuggling; the 9/11 attacks; and the theft of the 2000 and 2004 presidential elections; not to mention several undeclared wars. These events fit a tradition extending backwards, past Roosevelt’s foreknowledge of Pearl Harbor, past the Palmer raids, the sinkings of the Lusitania and the Maine, the Mexican War and the Witch craze. The 1950s, however, saw a quantum leap in terror. America was producing leaders who would drastically heighten both the predatory and the paranoid imaginations. We may never know how much of the Cold War hysteria – America’s second Red Scare – was deliberately created by reactionary elements in and out of government to demonize dissent and justify the permanent war economy. But we do know that the period included local and federal loyalty oaths; listings of over 150 suspicious organizations; the HUAC witch-hunt; the Hollywood blacklist; the Rosenberg trials and Joseph McCarthy’s wild accusations of treason within the government. 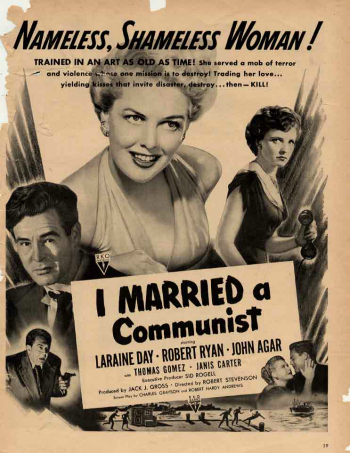 McCarthy never revealed the names on his famous list of “205 known communists” he claimed were working in the State Department. He didn’t have to; the damage – the terror – had been done. Reactionaries had their excuse to drastically increase funding to the internal security apparatus. The FBI, which doubled in size from 3,559 agents in 1946 to 7,029 in 1952, intimidated unions, school boards and universities, where 600 instructors were fired. 3,000 government workers lost their jobs and 12,000 resigned. Investigators used any methods available, including burglary and illegal wiretaps. The National Lawyers Guild’s defense of clients in communist-related cases made it a particular target, and the FBI burgled its office at least fourteen times between 1947 and 1951. As in the original Catholic Inquisition, most subjects of loyalty-security reviews were not allowed to cross-examine or know the identities of those who accused them. Many were never told what they were accused of. But, as in Salem, one could save oneself by naming names. The hysteria was a sobering reminder of how thin a veil our modern temperament is, how mythic furies still drive our imagination. And so similar to our present time. How did people cope? Just as they do now, millions managed to deny the hysteria by immersing themselves in consumer delights, vacuous sitcoms or paranoid narratives (Foreign Intrigue, I Spy, Passport to Danger, I Led Three Lives, The Day North America Is Attacked and Nightmare In Red.) Subtler film allegories (Invaders from Mars, The Manchurian Candidate and Invasion of the Body Snatchers) expressed the fear – or fantasy – of pollution. The 1953 version of The War of the Worlds ends by warning: “Keep watching the Sky. Stay vigilant against another attack.” 1958’s The Blob featured a shapeless, red jelly that, like Dionysus, seeped effortlessly through all man-made boundaries. People reported alien abductions, as they had reported Indian abductions for centuries. Later, Hollywood mythologized the C.I.A. James Bond, with his “license to kill,” was our newest Hero. Like the superheroes, detectives, G-men, military and cowboys who had preceded him, his violence was exempt from all laws. His existence (real or fictional) belied our faith in democracy and spoke to a higher power, or story: redemption through violence in service of American innocence. Complete trust was impossible. Whereas America’s “inner other” – the black man – had never changed, the “outer other” had long before exchanged his red skin for a “red” ideology. This was no longer a race war, as World War Two in the Pacific had been. “They” could be anyone or anywhere: your neighbor, or your cousin. The communist infection, like a microbe, was invisible. …there was not the slightest danger of a Soviet military attack. The reactionary slogan – My country, right or wrong – sums up how the old fears continued to motivate pro-war sentiment during the Viet Nam War, and how they fueled the white backlash against Civil Rights and feminism in the years that followed.